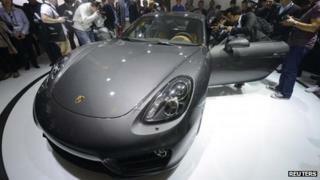 German luxury carmaker Porsche has said it has already beaten its annual record for most cars sold. It sold 128,978 cars worldwide in the 11 months to November - already beating the 118,868 sports cars sold in the whole of last year. Porsche marketing and sales chief Bernhard Maier said that last month alone was up 39% on November 2011. Demand came from China and the US, where there was 70% more demand for Porsches last month than in 2011. The demand from other countries has picked up for slack demand in recession-hit Europe. The result has been a 7.1% fall in car sales in Europe so far this year, with some southern European markets seeing sales slump by about a fifth. Premium carmakers, such as Porsche and BMW, and budget manufacturers, such as Hyundai, are doing relatively well. But mid-market players - such as Ford and General Motors' Opel and Vauxhall units - are having a torrid time, suffering falling sales, profits and market shares. David Bailey, a professor of international business strategy and economics at Coventry University Business School, told the BBC that Porsche's success was driven by "huge growth in emerging markets". "The premium producers are doing very well and the lower end is doing well too. What you have is a bit of a squeezed middle." Porsche's dramatic sales growth is a result of a strategy that was hammered out a long time ago. For years, the German sports car company was essentially a unique niche player offering various versions of its flagship 911 model, accompanied by various cheaper models for customers on a budget. All this changed a decade ago with the launch of the Cayenne sports utility vehicle. At the time, many said Porsche was in danger of damaging its brand by stretching it, but instead the Cayenne rose to become the marque's best-seller, helping cement its reputation as one of the world's most profitable carmakers. Since then, the range on offer has continued to expand, with the number of models expected to top 10 by 2016, and this is expected to continue to drive further sales growth in the years ahead. GM estimates it stands to lose more than $1.5bn (£935m; 1.2bn euros) on its European operations this year. This week, it said it would end car production at its Bochum manufacturing plant in Germany in 2016. "People want to be seen in a BMW or an Audi or a Mercedes, it's a rapidly-developing consumer market," IHS Automotive analyst Tim Urquhart told the BBC. On Porsche, he said that the "Cayenne has really captured the imagination in the US and China". At the higher end of the car market, Italy's Maserati sold 6,200 last year and said on Wednesday that sales in the first nine months of this year were up 2% to 4,754. But it hopes to sell 50,000 Maseratis a year by 2015. It plans to sell the sixth-generation of the four-door Maserati model, starting in the 150,000-euro range. By comparison, a Ferrari starts at 20% below the Maserati. A Porsche Panamera costs from 77,000 to 166,000 euros. Meanwhile, Indian-owned luxury carmaker Jaguar Land Rover said on Wednesday that it sold 324,184 vehicles during the first 11 months of the year, up 32% from the same period last year. It is planning to set up a factory in Saudi Arabia and began construction of a factory in China last month. In July, German mass-market rival Volkswagen agreed a deal to pay 4.46bn euros ($5.6bn; £3.6bn) to buy the remaining 50.1% stake in Porsche it did not already own. Volkswagen had acquired a 49.9% stake in Porsche in 2009.